Figure 1. Broken image amplification board (orthopedic table). Figure 2. 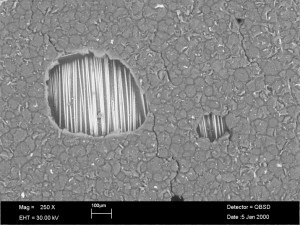 Scanning electron microscope image of the lower facesheet that separated from the aluminum base. Note that the adhesive surface shows no signs of a fracture, and the adhesive lacks bonding to the glass fibers. 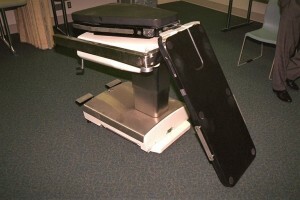 An image amplification board (orthopedic table) seen in Figure 1 suffered a failure in use; the patient fell to the floor during a procedure. The board has a composite sandwich construction with carbon fiber reinforced face sheets and a polymethacrylimide (PMI) foam core. The carbon fiber composite face sheets are bonded to an aluminum support base at one end of the board, and adhered with glass fibers pre-impregnated with adhesive resin (pre-pregs); the adhesive here failed and the board dropped to the floor. The image amplification board is a composite sandwich structure that measures 43 inches long by 18 inches wide by 2 inches thick. It is designed to be strong – supporting the weight of the patient – and at the same time transparent to X-rays. There are two thin face sheets, one on top and one on bottom adhered to foam material in between. As well as being strong, the design is very lightweight and stiff. Examination of the area where the carbon fiber face sheets were adhered to the glass fiber pre-pregs and the aluminum base revealed no signs of a fracture in the adhesive, and also that it lacked bonding to the glass fibers – Figure 2. The board had been in service for a number of years, but it is not known how many times it had been used; it failed due to a lack of adhesion between the pre-impregnated glass fibers and the surface of the aluminum support base.